This time the trip to New York City was about helping Gwenna, now twenty-two, move there to start a new life. She and I were flying there, so I suppose my greatest contribution was to let her use my two suitcases for more of her stuff, while I lived from a carry-on bag for my four-day stay. Otherwise, she was clearly fine on her own, taking the lead on airport chores and negotiating subway routes. Clearly, I was the follower on this trip, and happily so. She had found a sublet of a three bedroom apartment she would be sharing with two other young women in the Astoria area of Queens. This apartment was made more affordable by an elevated subway that ran down the street just outside their front window. I can tell you after just a few times, I really did get used to the rumbling that filled the apartment every few minutes. It just became part of a reverberating New York energy present in this place. The upside was the subway stop that was just a block away. The city was at our doorstep. Since I was the visiting tourist, I got to pick what I wanted us to see. I had an agenda that included some items we could both enjoy, like seeing world-class art at the Met and going to Broadway shows. I also had a separate list of offbeat items I would choose to inflict only on myself, like an extended walking tour to visit obscure buildings, certain neighborhoods and two Manhattan train stations. I would save my geeky solo stuff for the last day. On our first morning, we took the subway in for a late breakfast on a tree-lined side street in Greenwich Village. We overheard someone talking about “buying two units in order to remodel them into one big one,” and it made us smile. I try not to be too pedantic with my kids (and sometimes can’t help myself) but I wanted my daughter to understand her new city, so I told her what I knew about the gentrification that started in the eighties when affluent people quit fleeing to line in the suburbs and instead sought out cool funky places in Manhattan, giving birth to the word “yuppie” and the rise of the expansive loft apartments built into empty industrial spaces with tall ceilings and huge windows. And rich people talking about turning two living units into one. After that, we made our way north towards the Theater District via the new High Line Park, a walking trail created on an abandoned elevated train line on the West Side. It’s like a big elevated garden and is a hit with people, crossing streets and offering views of various neighborhoods and the Hudson River. 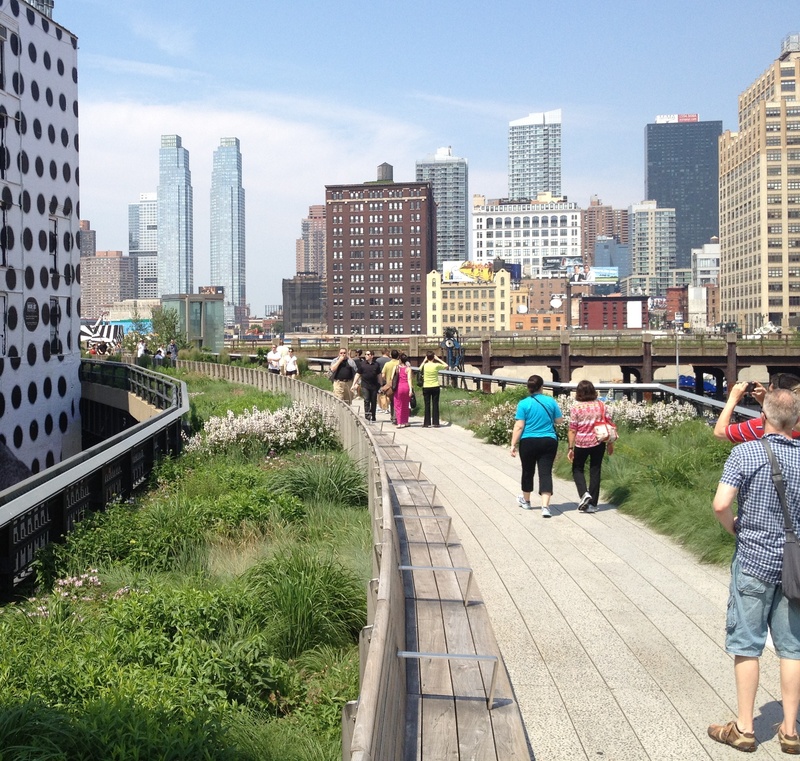 An abandoned elevated train track became a garden and an alternate walking route through the city. My big splurge for the week was popping for tickets to the “Book of Mormon,” deemed the best musical of 2011, and therefore totally on my daughter’s radar. I was happy to find it was less about lampooning a deeply held faith and more an indictment of human nature. It was seriously funny too. Tickets are quite expensive for any given Broadway show (over a hundred dollars each and sometimes double that!) but they sell out because the shows are terrific. By our figuring, there were eighteen different musicals running in the Theater District at that time. Heading back home to Queens on the subway meant the usual for me – follow Gwenna through a turnstile and then keep up as she wound through the people and down some stairs. Then wait a minute on a platform, amuse myself by looking at the variations of the subway tile on all the walls, watch headlights coming down a dark tunnel, board the train, stand with a hand on the overhead pole and then just people-watch. I loved it all. I can tell you that black is still the favorite color for clothes in that town. Often, there was a transfer for us at either Lexington or 42nd Street that involved walking along especially long tiled tunnels that wound around corners and up and down stairs, past a guitarist or violinist and then up more stairs because the crowded escalator would have slowed us down. I learned my daughter shares my penchant for taking stairs two at a time when we are on the move. The subway felt safe and clean enough. It’s not pretty, but it’s not ugly either. The graffiti is all gone now. It’s sturdy, runs on time and, for only $2.75, will take you just about anywhere in the city. Thumbs up from me. That’s pretty much how it went for us for those three days. We were willing to go anywhere the subway went. We made a trip to Saint John the Divine, a gothic cathedral being built from stone on the far upper West Side. I have fond memories of a visit I made there in 1987 and how fascinating it was to watch the stone cutting yard right next door where a master and apprentice masons were carving the individual stones that were to be hoisted into place. It was the Middle Ages brought to life. Each stone being carved seemed to me to be a sort of masterpiece, beautiful on its own, but more amazing how each piece would fit smoothly with its neighbors to create the shapes that then created the totality of the cathedral. I would never take gargoyles for granted ever again. When we got to the cathedral this time, I saw that the stone cutting yard was gone. I inquired and was told that Dennis the master mason had moved on years ago and the program had simply ceased to be. The cathedral looked complete to me, except maybe for the tower, I suppose. One night, on our way to another show in the Theater District, we were winding our way through throngs of people under the ever-present sidewalk scaffolding, below huge arrays of dazzling colored lights and video displays. It felt a lot like the opening scenes in Blade Runner, except without the rain or the despair. It was otherworldly, and therefore totally cool, in my opinion. My senses tend to open up big time when I travel. It’s why I go. The next day we went downtown to see the twin towers memorial. Trees surround two sunken square shaped pools that are positioned exactly where each building stood. Water cascades down the sides. 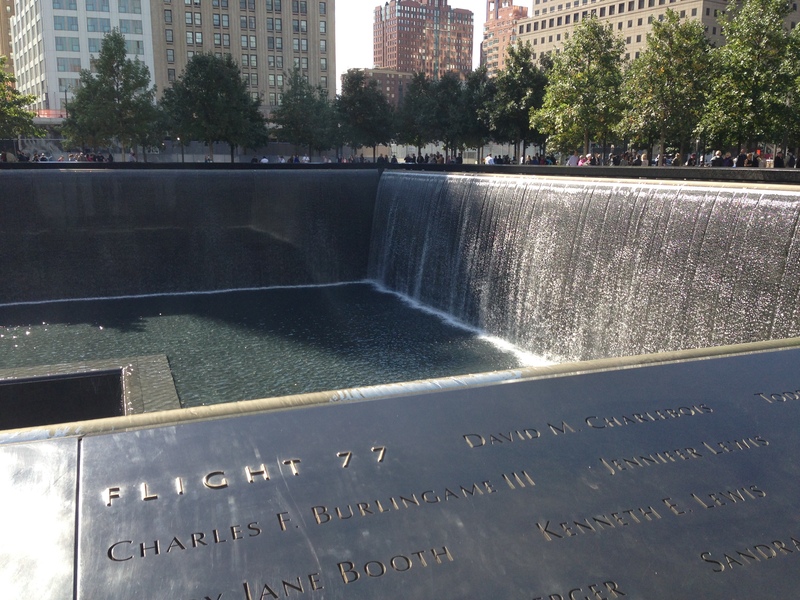 The black edge of the pools protrudes four feet above ground level with a sloped edge that has the names of the lost souls engraved on it. The memorial resonates. Later that day, we took the train to the lower East Side so we could walk across the elevated pedestrian lane of the Brooklyn Bridge, fulfilling another bucket-list goal for me on this most senior of the grand American bridges. We paused halfway across to turn and take in the Manhattan skyline, seen against the gathering dusk of a cloudy sky. The new “One World Trade Center” reached its famous 1,776 feet into the sky. “I have to say it doesn’t dazzle me,” I said. “And I really wanted it to. Maybe it’s fantastic on the inside.” Unfortunately the ring of metal gobbledygook at the top where the spire meets the building (satellite dishes or something like that) was one of its most distinctive features and looked like clutter. I looked at the other downtown buildings, some new, but most from a bygone era when a building wasn’t afraid to be a building. So many of the new buildings in Manhattan seem completely uninspired to me, relying on some wriggle in their skin, or a weird bent geometry in the building’s shape to try and create some sense of artistry. For many decades the older buildings of Manhattan have been able to impart human scale, despite their size, because of things like individual windows that open and walk-out patios wherever the building steps in. The human habitation implied by these touches are right there for all to sense. Once in Brooklyn, we hopped a cab to the Williamsburg area because it was supposed to be the hippest neighborhood in ultra-hip Brooklyn. I suppose I was expecting some sort of buzz to the place. Instead it was just extremely relaxed. It was clear that the twenty-somethings were running the place, and it was all pretty chill. (Please excuse lame unhip language on my part. I don’t know any better.) An antique store we visited had the usual sorts of things, but it seemed to me that some of the kitschier items were being displayed ironically. But I’m sure I’m making too much of that. With that visit, I had accomplished most of my bucket list for this trip, except for the wonky things I would do on my last day. I would give Gwenna the morning off from me so I could seek out things like the little pocket park that was the subject of a time-lapse study proving that people prefer movable chairs to fixed seating. I would go to the neighborhood that would have been wiped out if Jane Jacobs had not lead a citizen uprising fifty years ago against a freeway slated to cross the middle of Manhattan. You know, geeky stuff like that. To be continued next week. . . . . . The wind is rising. We must try to live. © 2011 Steve McKee. All rights reserved.